Under the water and it is submerge or drown. the difference between the mantle of talent and the core of exhaustion. The juxtaposition of moods in this poem suggests the destructive yet liberating force of the imagination. As elsewhere in this work, anxiety and fear often coexist with desire, suggesting the close relationship that exists between Eros and Thanatos, the intertwining of which is at the heart of experience and creativity. The blurring of boundaries between the physical and mythical worlds is analogous to the border crossings between the conscious and unconscious forces that constitute the signifying processes in any production of meaning. The poetic voice gives articulation to this dynamic activity, where the speaking persona is constantly confronted by some unknown other. As a result, the protagonist appears to be in a constant state of becoming, indeed demands to be in a constant state of becoming. Perhaps this is because Tusiata Avia operates within the framework of a peripheral tradition. Perhaps this is because she uses an assertive stratagem in the form of a desiring body rather than a defensive one. Whatever the reason, what strikes me here is a refusal to ‘territorialise’ the body in its diverse manifestations – geopolitical, cultural, historical, colonial, amorous, and purely sexual and reproductive. The first poem stages an encounter between Nafanua and Calamity Jane. It focuses on the painful history of their native societies and on their shared experience of exclusion, highlighting the dominant themes of the work. In particular, it dwells on the tension between exclusion and aggression while clearly advocating an ethos of compassion. It is a fragmentary text where the reader travels in all directions at once, realising that unspeakable truths lurk in the silences, the gaps between words, the blanks between stanzas. It is full of the whispers of ghosts. Yet it speaks of a refusal to succumb to repression and oppression. As I suggest above, ‘Nafanua dreams of water’ works as an allegorical reflection on the plight of the performance poet. It breathes a corporeal contour into the craft that wavers between the materiality of the female body and the imaginary. It gestures towards the transformation resulting from a text’s being written, performed and visited upon an audience as though keeping in check jouissance. in a tiny settlement called French Lick. and their quiet piroguing down the Tennessee River. Violence lurks under the surface of these poems and occasionally tears through the page as it does here in a carnival of images and echoes. ‘Nafanua talks about going to Washington DC’, ‘Nafanua sleeps rough in Central Park’ and ‘Nafanua speaks to her beloved in Palestine’ are acerbic pieces that resonate with prophetic intimations of impending catastrophes, as does the poignant piece from part two, titled ‘The opposite of déjà vu’, with its ‘armageddonish’ sky, ‘a stage for the second coming’. Of the more personal poems from part two, ‘We, the afflicted’ is unforgettable. It tackles the theme of maternal ambivalence with astonishing honesty and clarity, linking pain with glee in the event of a mother’s separation from her child. In this section, poems focus on other people’s bodies, including the failing body of the author’s father, and revisit the themes explored in part one from a more subjective standpoint. Here is an alternative expression of trauma on individuals who, while not directly affected by it are, as in part one, nonetheless haunted by it. Here, memory is about resonances and unprocessed experiences stored in the psyche and deposited in layers of flesh. 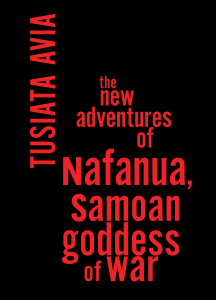 This entry was posted in BOOK REVIEWS and tagged Dominique Hecq, Tusiata Avia. Bookmark the permalink.